This tutorial explains how to profile the PARPG codebase. In order to optimize our application in a performance meaning of the word, it means that at a certain point in time we need to pinpoint exact locations where lots of resources are wasted, this process is called profiling. During profiling a dynamic analysis of the application is conducted and the result is a breakdown which shows where resources are spent. However profiling in itself can be tricky business since profiling is something related to the Heisenberg uncertainty principle. Basicly that by profiling you typically alter the state of the system. 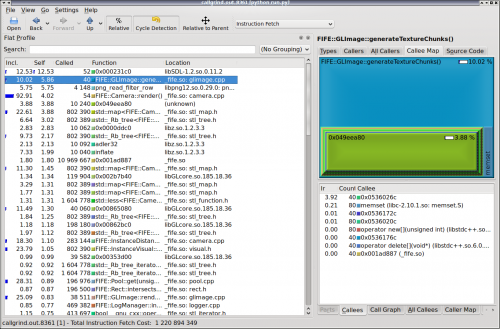 Profiling can happen by code annotation, or by runtime analysis, but none of these come for free, so profiling often results in the application running several times slower than normally. Next to this we should keep in mind that in this context we even have an extra problem since we're writing a Python frontend to a C++ backend. Which means that a Python-only solution or a C/C++-only solution will not be sufficient. As a result I will present on this page several suggestions on how profiling can be done, and which tools we can use. However who wants to perform profiling will need to make some decisions on the most ideal solution for the problem under investigation. One important note is that not everything on this page is portable, bear in mind that all things described on this page have only been tested on a .deb based Linux system which might introduce some problems when using the information on this page to work on other systems. Valgrind for example is only available on Linux and Mac but not on BSD/Win32/... and all your other favorite choices. In this case you can make of the pstats module to do some data mining of your own (within Python), or for example to save the profiling output to a file and postprocess it in a standalone application. (Note: you can pass multiple keys to sort on, however this doesn't work that well for timing information, since time information is stored more precise than displayed a stats.sort_stat('tim', 'cal') will give unexpected results). Which learns us that the application is spending most of its time within FIFE (_fife.Engine_pump is the heartbeat which make FIFE render a new frame. So at this point cProfile is only capable of pointing to FIFE. In order to profile more specific chunks of python code, the approach should be not trying to profile the entire main application, but only a chunk of the suspected guilty function(s). For this the example code above can be reused. Callgrind is a tool which is part of the toolsuite, this is also the methode mentioned in the FIFE wiki. Callgrind functions by attempting to detect function calls and returns, unfortunately callgrind is very heavy profiler, meaning it will have a heavy impact on performance. In order to properly use this tool, one would install the valgrind and the kcachegrind packages (the last one is a visualization frontend). 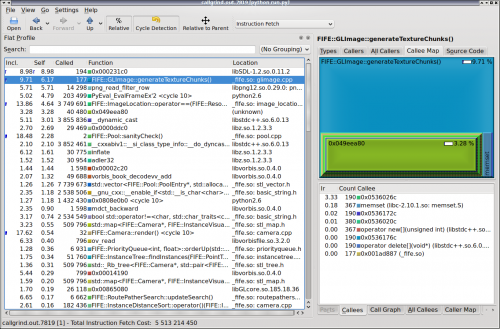 To open kcachegrind and visualise the file. Do note that at this point we are also profiling the python interpreter, which will prevent us from pinpointing problems within Python code. When you want to look more deeper (as in which system calls are used, you will also need to pass special options to callgrind). On the left you see the callgraph where yo ucan sort on function name, number of times called, time spent in the function, total time. Typically you will find the fat functions by sorting on the self table. On the right you can see who calls this function, the distribution of time in the called functions. Note that this is a profile of the full application run, thus also including the loading of resources etc. However most of the time you are only interested in the 'why-o-why-is-my-framerate-that-low'-question. This is why there is a possibility to start/stop callgrind on request. No information available as instrumentation is switched off. If you compare both outputs you see that in the first output some initialization functions (like FIFE::Pool::sanityCheck() consumed 2% of CPU but disappeared when we are looking at the second run. Also since the first time we didn't show that many frames the FIFE:Camera::render() apparently seemed to be of a lesser importance). Install oprofile by getting the packages called oprofile and oprofile-gui. oprofile consists out of a kernel module which periodically samples where the instruction pointer of your CPU is pointing at. So it has an extremely low impact on the system under test. But it also goes extremely wide, it will profile the ENTIRE system (so it has no knowledge of program boundaries). So this means if you happen to be running a SETI client and a distributed.net client along with eclipse while watching youtube, you will find a lot of garbage before you find what you might be looking at. Mind the sudo, since this is a very low level operation, you will require elevated privileges. In the configuration tab you might want to say you have no kernel image available for profiling (we don't need that anyhow). Check the 'per application checkbox' and click start to run profiling. Then do whatever you want to profile, click stop and save samples file to terminate the application. warning: /dev/zero could not be found. warning: [vdso] (tgid:9468 range:0xfa5000-0xfa6000) could not be found. The verbosity of a module (aka why have we got details for fife.so and not for libGLCore.so ?) depends on the fact whether debugging symbols are available or not. Reading the C++ STL output is also something which is an acquired taste. You should keep in mind that the template system returns a very verbose messages (as can be seen) and the untrained eye will probably not know that the std::_Rb_tree<> is nothing more than a lookup happening in a map (which is backed by a red-black tree engine).